HfP’s Chair, Esper Sabreen was invited to speak at two events. On 13 February, he spoke at the event Palmyra Forever, at the Church of Bordighera in Sanremo, Italy, organised by the Lions Club. On 26 February 2016, he was invtied to speak at the conference II Jornada d’Arqueologia de Sitges – Arqueologia del conflicte in Barcelona. HfP’s Rene Teijgeler participated in the event “A Meeting and Workshop about the Relation Between Heritage, Culture, and the Arts and Refugees and Peace Building” in Amsterdam, presenting the work of HFP and discussing peacebuilding. See here for more details. View from within Aleppo citadel of damage to wall and neighbourhood . Copyright: DGAM. 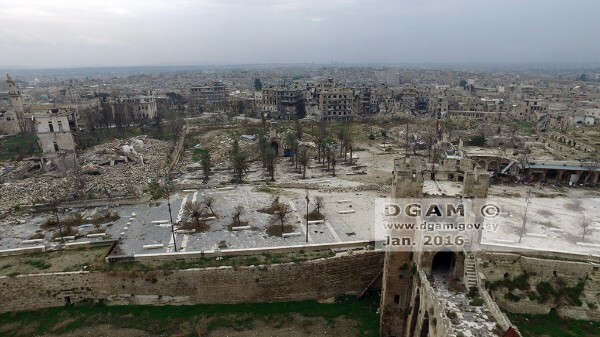 On February 15 the DGAM published a second round of photographs of the Aleppo Citadel and surroundings. See them here. On February 10 2016 the Jerusalem Post reported damage to Aleppo’s Central Synagogue from fighting. For details, see here. A February 5 2016 article by Lizzie Porter for The Telegraph reviews damage to Aleppo’s citadel, with photographs. Read it here. The March 2016 edition of Smithsonian Magazine contains detailed coverage on the situation in Aleppo here, with details of damage to the souk, the citadel, the National Museum, and the shrine of Ma’rouf Ibn Jamr. On February 16 2016 Sputnik News takes the reader through the Old Town and Citadel of Aleppo here. On 18 February, drone footage of the damage to the area was released, which can be viewed here. On February 17 2016 the DGAM published an update on the state of Qalaat Salah al-Din, one of Syria’s World Heritage sites, with fourteen photographs showing overgrowth and fire damage. See it here. 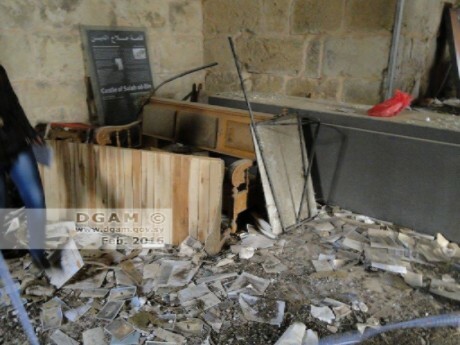 The DGAM announced that a number of looted objects were recovered in Qamishli, Haseke province. The seized antiquities include a number of pottery vessels and ancient pieces used as samples taken from Mohammed Diyab archaeological site in al- Qahtaniyeh area in Qamishli Countryside. He noted that the pieces have been stolen from different archaeological sites during the presence of ISIS terrorists in the area, adding that popular figures in the city, in coordination with Antiquities Department, helped protect an archaeological cemetery which has been uncovered recently. Read the full article in Sana, 24 February 2016. The Peninsula Qatar looks at pollution and damage to Syria’s nature on February 23 2016 here. A new art series, ‘Cultural Beheading’, is being undertaken by two artists in Damascus, Humam Alsalim and Rami Bakhos to highlight the destruction of Syrian heritage. See more here. On a similar theme, the Syrian artist Tammam Assam is now in Dubai, where he makes political art. He was interviewed by the president of ARCH here. Issue 21/22 of the DGAM’s journal Mahd el-Hadarat has been published, it is reported on February 9 2016. See details on the contents of the journal issue and its research here. The DGAM announces the publication of the second volume of the Encyclopedia of Archaeology in Syria here. The DGAM reports that on February 7, the Minister of Culture visited the Crusader-era castle of Qalaat Salah el-Din near Latakia. See the report here. The Aleppo Project‬ asked 1001 Aleppians in different locations if they would return to Aleppo‬ after the war. Read their second data snapshot for the findings, in English here, and Arabic here. The DGAM announces that the Syro-Hungarian archaeological mission at al-Marqab Citadel (Tartus) has completed its fifteenth season. See the brief here. On February 16 2016 UNESCO reports that it will sign an agreement with Italy “to establish a task force of experts focusing on the conservation of cultural heritage affected by crises around the world.“ See the brief here. See also the discussion on the ARCA Blog on February 16 2016 here, and on Hyperallergic on February 16 2016 here. NOTE: despite the press confusion, this is not a Blue Helmet Peacekeeping force, although there is the potential for training / collaboration should the need arise. The UN HRC resolution 10/23 established a new special procedure: “independent expert in field of cultural rights”for 3 yr period. Read the report here. In its March 2016 edition, Smithsonian Magazine examines international efforts to create virtual reality ‘versions’ of monuments destroyed by Daesh. Find it here. The Art Newspaper on February 10 2016 looks at the work of Cheikhmous Ali and APSA to document damage to Syrian heritage. The article can be found here. Sam Hardy offers an historical overview of the conflict antiquities trade (in pdf) here. The Antiquities Coalition has produced a map of threatened heritage. It can be found here. There is also information from Al Arabiya here and the Saudi Gazette here. Experiences of reconstructions through psychological and educational projects” from Ruwanda, with a symposium “Syria: Impact Strengths and perspectives on the civic engagement”. Videos are available online here. ISIL forced prisoners to destroy cemeteries in Mosul (ASOR CHI Incident Report IHI 15-0101). The Bosra al-Sham Department of Antiquities posted additional photographs of the damage to the citadel caused by recent SARG barrel bombings (ASOR CHI Incident Report SHI 15-0166 UPDATE). Jebel Zawiya in Idlib Governorate (ASOR CHI Incident Report SHI 15-0169). Regime forces severely damaged the Al Turkman Mosque in Jisr Al Shoughour city in Idlib Governorate (ASOR CHI Incident Report SHI 15-0170). The Day After Heritage Protection Initiative has produced a report on the damage. Russian airstrikes caused severe damage to Batul Mosque in the Zebdiya neighborhood of Aleppo (ASOR CHI Incident Report SHI 15-0171). ISIL bombed ten Assyrian homes and a monastery in the village of Tel Keppe in northern Iraq (ASOR CHI Incident Report IHI 15-0102). ISIL destroyed and looted multiple sites to create military positions against Iraqi forces around the ancient site of Qalat Sharqat, also known as Ashur (ASOR CHI Incident Report IHI 15-0103). The Omar bin al-Khattab Mosque in Ma’arat el-Artiq in Aleppo Governorate was damaged by a Russian airstrike (ASOR CHI Incident Report SHI 16-0001). Three Sunni mosques in Iraq, including the Ammar bin Yasser Mosque and al-Fath al-Mubeen/Fateh Mosque in Babil Governorate, were bombed and partially destroyed (ASOR CHI Incident Report IHI 16-0001) . Iraqi armed forces continue their efforts to retake the city of Ramadi from ISIL militants. The Al Kabir Mosque in Hamima near Aleppo was damaged by airstrikes (ASOR CHI Incident Report SHI 15-0158). Sheikh Yassine Mosque in the village of Al Najiyeh in Idlib Governorate was damaged by airstrikes (ASOR CHI Incident Report SHI 15-0159). The Day After Heritage Protection Initiative has produced a brief, illustrated report on the damage to the site. An ISIL-affiliated suicide bomber attacked the Ahlu al-Baiyt Mosque in Baghdad (ASOR CHI Incident Report IHI 15-0100). Airstrikes land near the Mosque Tekkiye al-Suleimaniye and National Museum of Damascus (ASOR CHI Incident Report SHI 15-0161). SARG airstrikes cause partial damage to the Bilal Mosque and Abi Thar Al Ghafari Mosque in Tadmor, Syria (ASOR CHI Incident Report SHI 15-0160). The DGAM reports on-going illegal excavations, construction, and vandalism in several Dead Cities (ASOR CHI Incident Report SHI 15-0162). The DGAM reports ongoing illegal excavation at sites in southern Quneitra, particularly at Majduliyah (ASOR CHI Incident Report SHI 15-0163). Airstrikes damage the Al Kabir Mosque and Al Zawyeh Mosque in Saraqib in Idlib Governorate (ASOR CHI Incident Report SHI 15-0164). The Day After Heritage Protection Initiative has produced a brief, illustrated report on the damage to the Al Zawyeh Mosque in Saraqib. The DGAM reports ongoing illegal excavation at sites in Jebel Wastani, in particular that of Kefert Aqab in Idlib Governorate (ASOR CHI Incident Report SHI 15-0165). The Bosra al-Sham Department of Antiquities reported that SARG forces dropped barrel bombs on the Ayyubid Citadel and Roman Theater in Bosra (ASOR CHI Incident Report SHI 15-0166). DigitalGlobe satellite imagery shows ongoing military occupation of Tell Jifar near Apamea (ASOR CHI Incident Report SHI 15-0167) in Hama Governorate and Tell Jindires in the Aleppo countryside (ASOR CHI Incident Report SHI 15-0168). A report by The Day After Heritage Protection Initiative details to Ebla in Syria (ASOR CHI Incidient Report SHI 15-0150 and Appended TDA Report). In-country sources in Syria report on the condition of Tell al-Atarib in Aleppo Governorate (ASOR CHI Incident Report SHI 15-0151) and the Tomb of Omar Bin Abdul Aziz in Hama Governorate (ASOR CHI Incident Report SHI 15-0152). ISIL releases video of executions at Qaalat al-­‐Rahbeh (ASOR CHI Incident Report SHI 15-­0153). Russian airstrikes and clashes between ISIL militants and pro-­‐Assad forces in and near Tadmor/Palmyra cause extensive damage in the area (ASOR CHI Incident Report SHI 15-­0155). SARG airstrikes continue in the governorates of Damascus, and Homs. Russian airstrikes continue in the governorates of Aleppo, Damascus, Hama, Homs, Idlib, and Latakia. Ongoing airstrikes on the city of Aleppo, including portions of the Old City, caused extensive damage and high civilian casualties. In its March 2016 edition, the Smithsonian Magazine examines ‘cultural genocide’ in Syria, with detailed coverage on the situation in Aleppo and a focus on the work of the DGAM. See it here, also picked up on February 20 2016, by the Pulitzer Center looks at the the struggle to save Syria’s culture here. The Express Tribune examines the idea of public ownership of heritage sites on February 22 2016 here. On February 19 2016 Expresso looks at the ‘Art of War’ here, with some good graphics on trade routes (although the article is Portuguese). Forbes takes a look at ‘sci-fi archaeology- using satellite imagery to track looting at threatened sites, among other endeavours here (February 19 2016). Dr. Iris Gerlach, German Archaeological Institute, examines looting in the Near East for EUNIC (European Union National Institutes for Culture) (N.D.) here. On February 18 2016 SAFE looks at the problems involved with quantifying the illegal antiquities trade here. The article is a response to a report from the University of Chicago published on January 31 2016 here. On February 10 2016 The Providence Journal publishes a letter from Michael Zimmerman, addressing the damage to Muslim heritage caused by Daesh. See it here. On February 9 2016 the Huffington Post looks at some of Syria’s cultural heritage sites before the war here. On February 5 2016 The Interpreter looks at the use of technology to protect cultural heritage in warzones here. On 24 February, the Atlantic Council asks What Can be Done for Syria’s Antiquities?, here.